The total stay at the Poas Volcano National Park will be 40 minutes: 10 minutes walking on the trek to get to the crater viewpoint, 20 minutes at the crater viewpoint, and 10 minutes walking back. There is no access to Botos Lagoon and in case of fog, there is no extra waiting time as we used to do in the past. Due to the altitude and activity of the Poás Volcano, this tour is not recommended to any person with heart conditions, high blood pressure, people who have had a recent surgery, pregnant women or children. 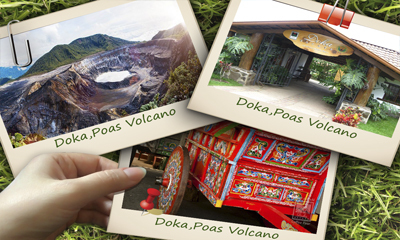 We will visit the Doka Coffee Estate for a delicious breakfast. Then we will be treated to a coffee tour in an actual coffee plantation where we will learn the ancient techniques used by the experts to produce some of the best coffee in Costa Rica and around the world. The careful process involved in the cultivation, harvesting and roasting of the Golden Bean will then be illustrated, very hands-on, and then we will savor the delectable product.